Barr Gazetas provided an improved working environment to reflect the Malcolm Hollis progressive reputation and enlightened approach to surveying. We had worked with Malcolm Hollis on other projects. For their new offices Malcolm Hollis then met with a number of architects to assess the relevance of recent projects and knowledge of designing for agile working. We were selected. Malcolm Hollis wanted an improved working environment to reflect its progressive reputation and enlightened approach to surveying. We were briefed to deliver office space for 'agile working'. We helped Malcolm Hollis define what this meant to them and then designed a completely distinctive scheme, tailored to the client's needs. 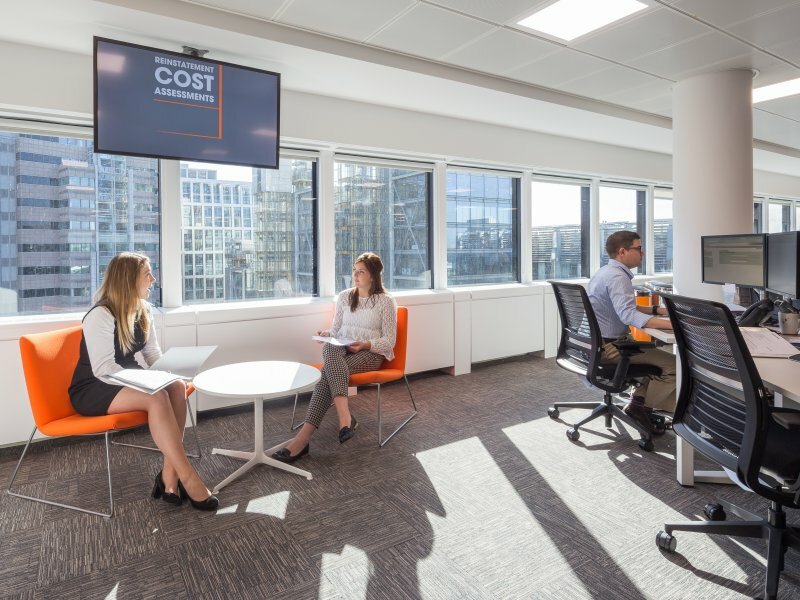 A key part of the process was our role in guiding Malcolm Hollis to understand and articulate what the company really wanted and needed from its new working environment, beyond the stated "agile working". We presented various concept sketches demonstrating a scale of 'radicalness' in office environments. We wanted to ensure the new office would satisfy Malcolm Hollis' needs into the future, as well as now. Once the client selected a concept, we carefully steered them out of their comfort zone to create and deliver new offices which would serve the company effectively for years to come. We've described this process as "Listen. Push. Listen. Push". The client commented on the approach, "We wanted a fresh space that would set us apart from our competition that reflected our personality and that we'd be proud to bring clients to. Surveyors are generally perceived as quite straight. We have a brand and reputation that breaks that mould and Barr Gazetas certainly helped us to demonstrate this through our office space design. They not only fulfilled our brief, but cleverly pushed us to challenge our expectations even further about what a more futuristic working environment could be like. It's a revelation and all the staff absolutely love it." 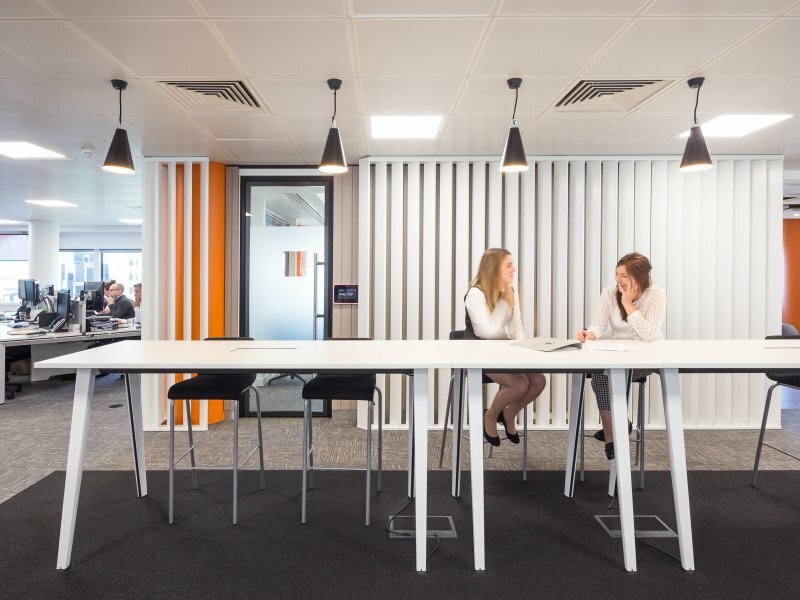 London Wall (62 staff) The desks have been placed at a 45 degree angle, which is space efficient and adds interest. The desks are also set within the columns at the perimeter of the floor plan. 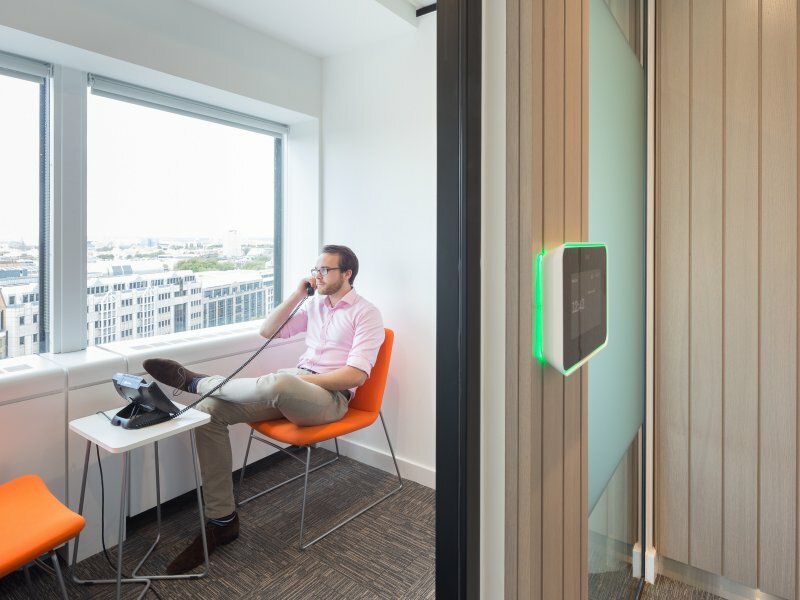 This leaves space by the windows which have impressive London views, and where informal seating areas have been created for people to meet or take phone calls. Malcolm Hollis wants to be known as having a sense of fun and a love of sport. The new conference room can be opened up and joined with the large family-style kitchen area where Malcolm Hollis will host events and will stream sports games for its staff to watch together. 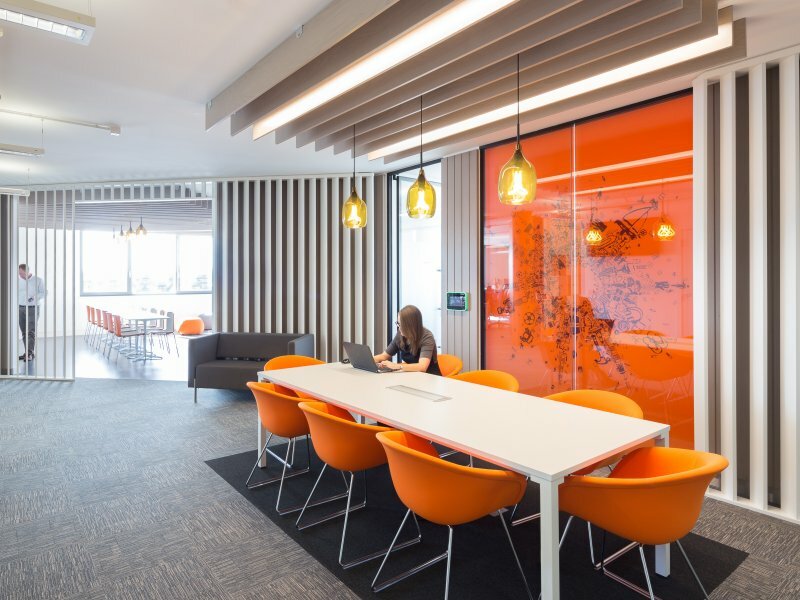 Splashes of colours have been introduced throughout using the company orange to draw the eye to details such as the business bar joinery and the leather clad banquette seating. The "starburst" logo is an important part of the Malcolm Hollis identity and feature in large scale on both sites. We also introduced a feature of exposed, semi-transparent timber fins in the reception area. The fins both conceal and also offers glimpses of the office beyond and are a nod to the role of a surveyor in working with the 'bones' of a building. 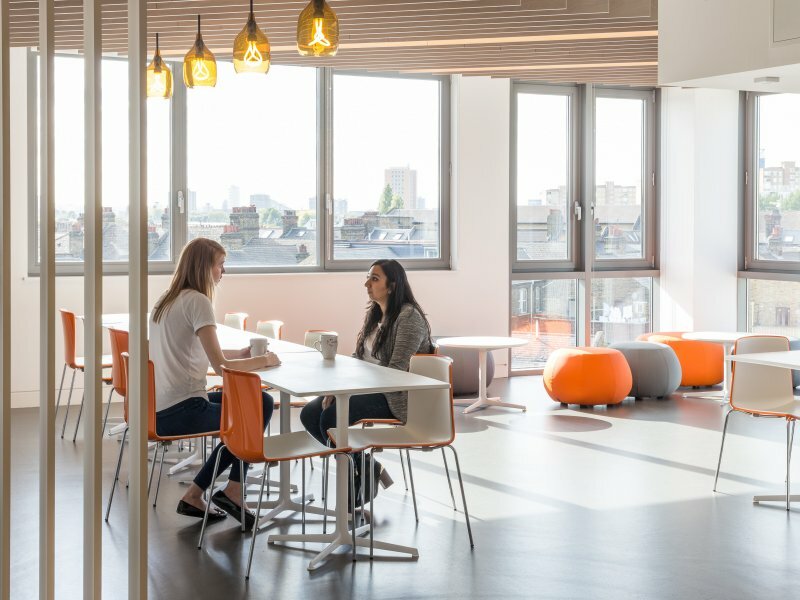 Battersea (58 staff) As the Battersea site is not largely intended to host clients, the decision was made to have no reception desk, instead replaced by a large informal seating area, which can be used flexibly by staff. Battersea will host training sessions, therefore we have designed a fully equipped training room that can be expanded via a retractable wall partition leading onto a smaller meeting room. At its largest, this will accommodate up to 42 people. 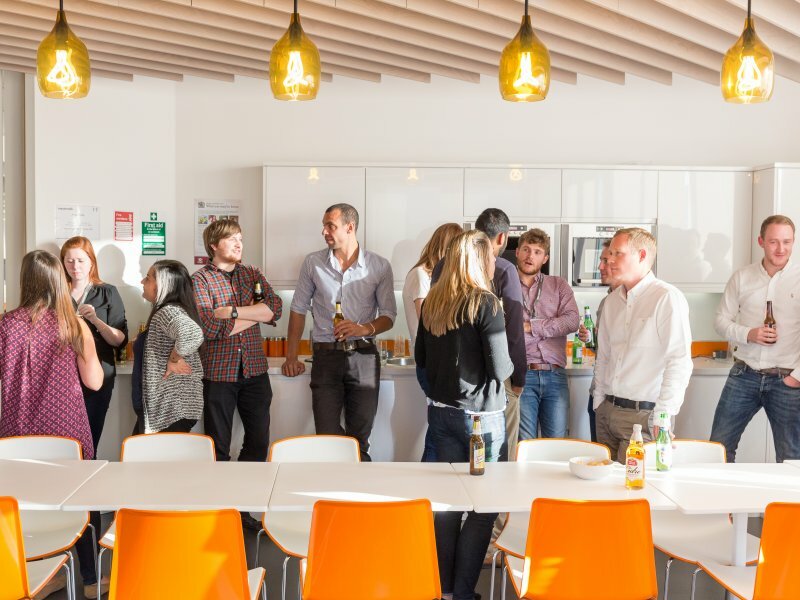 Our recent fit out experience is mainly internet start-ups and software developers. Although this seemed a world away from a surveying firm this worked in our favour as Malcolm Hollis wanted a radical approach to their business and new offices. Malcolm Hollis wanted to move into a paperless working environment so We delivered an office that is far more space efficient. The new hot-desking method includes lockers with integrated boxes for staff to keep their belongings. The client also felt that their former workspace didn't encourage enough interaction or collaborative working. We designed a central hub for break-out meetings and informal working areas. It is an important area that can be used socially to get people interacting and also a versatile place for people to work. They also created collaboration spaces for both team and client meetings. The new open hot-desking method of working meant that there would be a lack of privacy spaces. We therefore designed quiet pods for confidential discussions. The London Wall site had a unique design challenge as the services to another floor ran in great blocks through the corners of Malcolm Hollis' floorplan and could not be moved. This created four awkward corridor spaces at each corner. We made a feature of these by giving each corner a distinct purpose and personality that relates the new progressive workstyle. 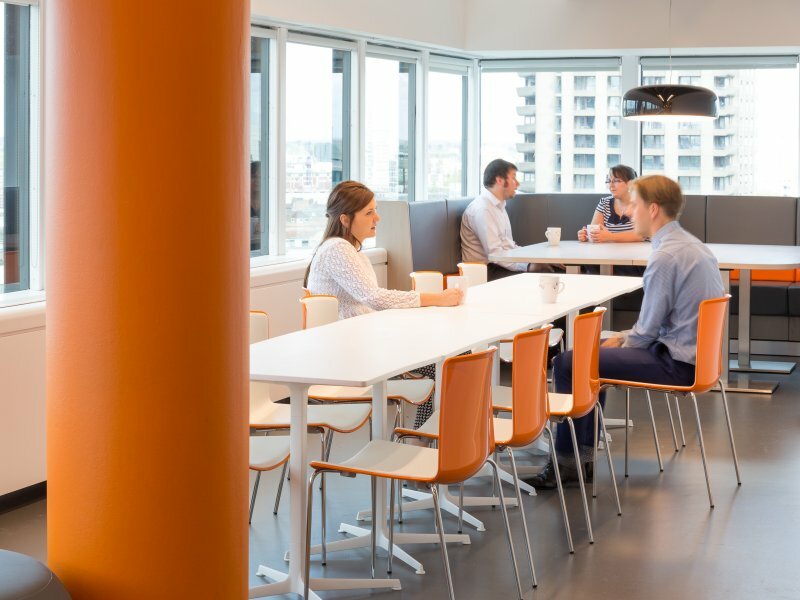 The corners are now an informal meeting area with smart TV, a collection of small meetings rooms, a break out area and kitchen, quiet pods and hot desking zones. The project is progressive as much in process as in outcome. Malcolm Hollis exists in an industry that is not known for being particularly innovative in terms of approach, but they are breaking this mould. The client knew they wanted their new working environment to reflect this ethos but they weren't certain how this would manifest, or how far it could be taken. 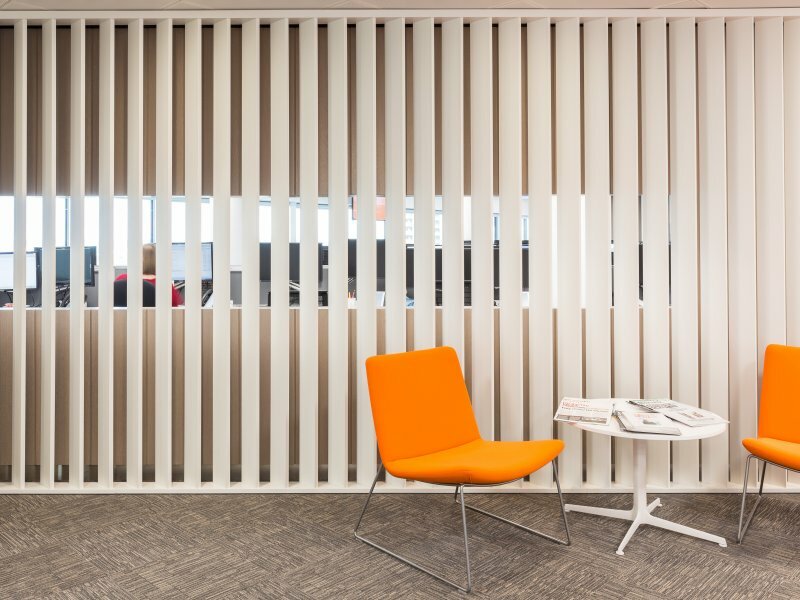 We used our experience to take Malcolm Hollis on a journey to realise a working environment that is not only far better suited to their needs than which they had envisaged, but also thoroughly reflects their forward-thinking brand now and into the future.